In a famous note probably of 1508, Leonardo described witnessing, in the hospital of Santa Maria Nuova in Florence, the death of a man who claimed to be over a hundred years old, whereupon Leonardo conducted an autopsy ‘to see the cause of so sweet a death’. This double-sided sheet comes from the notebook compiled following that dissection, as an attempt to make sense of his findings; the actual dissection notes, which were presumably rapid, sketchy and stained with gore, do not survive. While a grounding in human anatomy was a commonplace in the training of Renaissance artists, Leonardo was one of the few to conduct dissections himself (contrary to popular belief, properly regulated dissection was permitted by the Church). He first became seriously interested in the subject in the late 1480s, outlining a plan for a treatise on the subject and making a number of drawings based on a haphazard combination of animal dissection, human skeletal material and received wisdom. 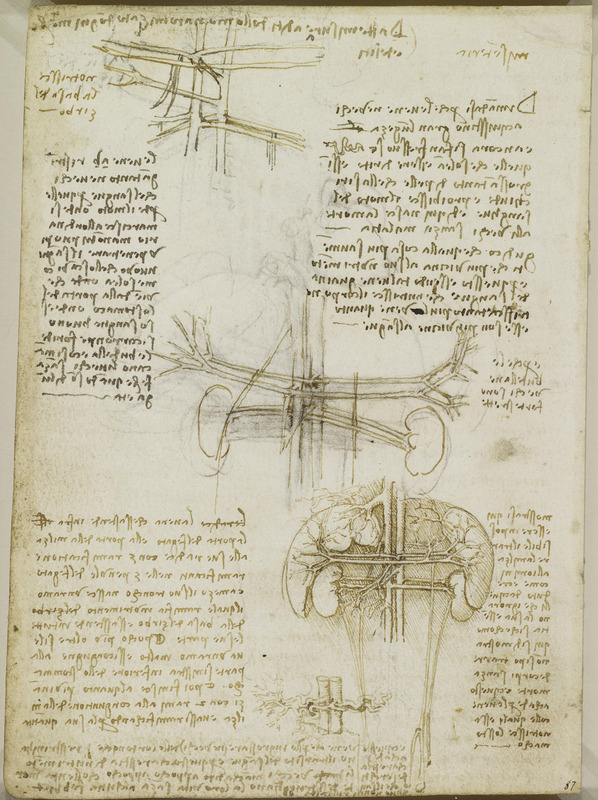 Leonardo returned to the subject around 1505 with his studies of musculature for the Battle of Anghiari, and for the next eight years the study of anatomy became his most important scientific pursuit. All the veins and arteries arise from the heart. And the reason is that the largest veins and arteries are found at their conjunction with the heart, and the further they are removed from the heart, the finer they become, dividing into very small branches. And if you say that the veins have their origins in the liver because they have their ramifications there, just as the roots of plants have in the earth, the reply to this comparison is that plants do not have their origin in their roots, but the roots and other ramifications have their origin from that lower part of the plant which is situated between the air and the earth. And all the lower and upper parts of the plant are always less than this part which adjoins the earth ... and in consequence, the veins take their origin from the heart, where they are biggest. 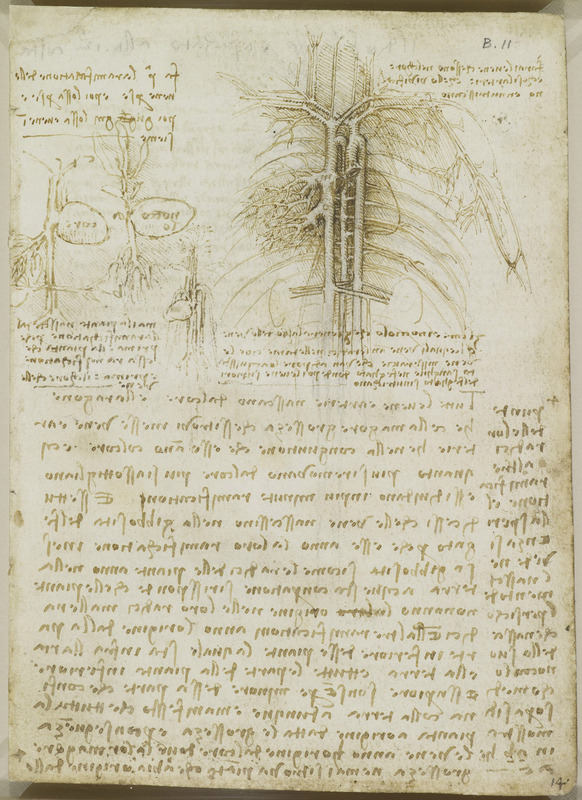 The other side of the sheet, unusually, shows Leonardo struggling to make sense of his dissection notes, as he attempted to present his findings with a rectilinear regularity quite unlike that actually found on opening a body. The paths of the vessels connecting the liver, spleen and kidneys to the aorta and vena cava are repeatedly drawn, both in chalk and in ink, and are thus rather confused in the upper two studies. Only in the third drawing does Leonardo arrive at a clear, if only partially correct, arrangement. In that drawing the aorta – on the right as we look at the sheet – gives off first the celiac axis, from which the common hepatic and splenic arteries arise (the left gastric is absent), then the superior mesenteric artery and lastly the renal arteries. The vena cava, alongside, receives the hepatic veins from the upper portion of the liver. The liver is small and the spleen enlarged, indicative of cirrhosis of the liver and associated portal hypertension in his elderly subject. Why the veins in the aged should acquire great length, and those which used to be straight become so flexuous, and the coat thickens so much that it closes up and prevents movement of the blood. From this arises the death of the elderly without disease. While Leonardo’s anatomical studies were far from perfect, his understanding of the heart and of the muscles and bones surpassed that of any contemporary, and his drawings have a clarity and subtlety not to be seen again until at least the eighteenth century. But his treatise on anatomy was never written, and Leonardo’s astonishing investigations were to languish unappreciated for centuries.